Bend Bottle is a soft & collapsible water bottle that you would want to bring wherever you go. Whatever you do and wherever you go, it is important to keep yourself hydrated. For many years, bottled water has been the go-to source of water on the go for most people. However, there are growing concerns about the menace of plastic pollution and drinking from single-use plastics have been discouraged. The bend bottle is a novel water bottle that seamlessly combines elegance and functionality. If you are looking for a unique water bottle that is easy to carry and even easier to drink from, the Bend Bottle is the perfect option for you. The bend bottle holds a unique aesthetic appeal while still serving its function as a water bottle. Inspired by a champagne bottle, the company behind this water bottle hoped to create something that is just as beautiful but applicable to everyday use. And they were able to do just that. 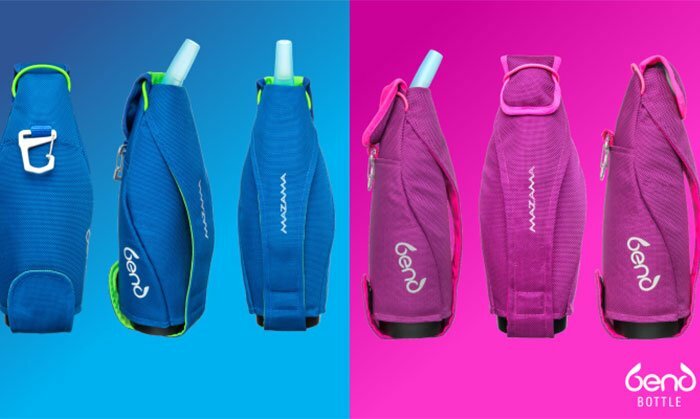 The bottle comes with a unique flip spout that seals off the flow of fluid once it’s folded over. The diameter of the spout is just perfect for drinking as well as pouring. Furthermore, there is a magnetic cover that keeps the spout protected whenever the bottle is not in use while providing easy access. There are magnets located at the front and back of the bottle. You can rest assured the lid would be firmly secured. The bend bottle comes with a jacket exterior that is made from luggage-grade ballistic nylon. This jacket provides superior protection for the inner bottle thereby increasing its lifespan. Asides the protective function, the jacket is also equipped with multiple options. There’s an integrated handle, a loop, and a clip hook. You can always grab the bottle by the handle or finger loop and if your hands are full, the bottle is light enough to be carried with one hand. The makers claim that the interior of the bottle is made from food-grade silicone, containing no PVC, BPA, or any other harmful chemical. Whether you’re carrying hot or cold fluid, you can be sure there’s no leaching of chemicals from the bottle into your fluid. There’s also an extra insulating layer at the interior to keep your water cold or hot. When you add the fact that the bottle is dishwasher and freezer safe, you’d agree this is the ideal water bottle for everyone. The Bend Bottle has a generously-sized spout. In addition, the large bore top and bottom openings make cleaning especially easy. The bottle is currently at the crowdfunding stage. You can visit the Indiegogo page to get information about the available pledges and rewards. Delivery is expected to commence by May 2019.